I decided to do some Journey to the West posts this month, because Monkey King II is coming out for the Chinese New Year and this is the year of the Monkey. Going to start things off with two reviews of films that adapt the material from the novel. For those unfamiliar with Journey to the West, it is one of the four classic Chinese Novels. Written by Wu Cheng'en* during the Ming Dynasty it tells the story of a monk named Tang Sanzang (also known as Xuanzang, Tripitaka and Tang Seng) who is assigned a mission to go west from China to India and retrieve Buddhist sutras on Vulture Peak. It is set during the Tang Dynasty and follows Tang Sanzang as he goes from one adventure to the next, facing demons, spirits and monsters on his lengthy journey. 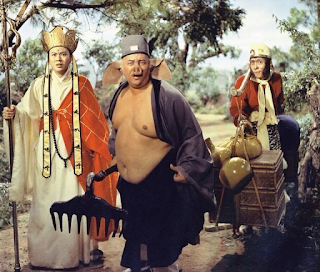 He is joined by Monkey King, Pigsy and Sandy Friar (all powerful and monstrous beings in their own right). It is told over the course of 100 chapters and is available in a number of English Translations (I recommend the four volume translation by Arthur C. Yu). Monkey King is something of a break-out character in the tale. The book actually begins with his origin story and he is popular because he is such an unorthodox hero. Starting out as a chaotic monkey born from a stone who nearly overturns heaven itself, he is imprisoned by the Buddha in Mount Wuxing (which is formed from Buddha's palm) and freed when Guanyin tasks him to accompany Tang Sanzang on his westbound journey. Monkey joins Tang as his disciple but proves overly violent and disobedient. He is contained by a magic headband given by Guanyin (it allows Tang to cause Monkey King crushing headaches when he chants). 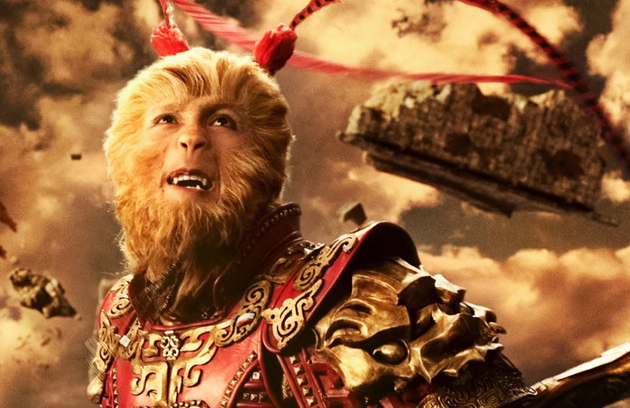 So many of the adaptations have focused on Monkey King in some way. Monkey King is a 2014 film directed by Cheang Pou-Soi, starring Donnie Yen (Monkey King), Chow Yun-fat (Jade Emperor), Aaron Kwok (Bull Demon King), Xia Zitong (Nine Tailed Fox Demon) and Joe Chen (Princess Iron Fan). It tells to story of Monkey King's birth, rise to power and the upheaval he causes in heaven. Because I watched and read some negative reviews of The Monkey King, I was reluctant to watch it. However I ended up buying it on Amazon with a Holiday gift certificate along with a bunch of other movies and was pleasantly surprised. I understand many of the criticisms people had of the film, but I probably shouldn't have allowed them to influence my earlier decision to avoid it. Part of the issue is, as one review pointed out, this is a more family friendly version of the story, and the character Monkey King is a bit more likable than in some other versions. However I found it incredibly entertaining and enjoyed Donnie Yen's performance as Monkey (both for the physical skill he brings and the personality). It isn't the best adaptation I've seen but it didn't leave me bored or fail to hold my interest. Even though it is family friendly, The Monkey King still cleaves somewhat closely to the source material. It is basically the first 5 or 6 chapters of Journey to the West. There are some inventions, some tweaks here and there but on the whole it does a good job giving his origin story for a new audience (and I think this was aimed at an international audience). There are changes though and some are notable. They add in a love interest and position Bull Demon King as an early antagonist. This is used to give Monkey King a more sympathetic reason for creating an uproar in Heaven. These changes are significant because it alters Monkey King's motives and makes his behavior arise more out of misunderstandings than his own complicated personality. Personally I prefer the latter, but it didn't wreck the movie to make him sympathetic. The overall depiction of Monkey King is much more sympathetic here. I like Monkey King a bit on the mean side, but this works for what they are trying to do. What impressed me was that I kept forgetting it was Donnie Yen in the role. Part of this was the special effects, but much of it was his performance. Is he my favorite Monkey King? Probably not, but he did a good job and had a slightly different take than Stephen Chow or Liu Xiao Ling Tong. One complaint a lot of people had is overuse of CGI. It isn't a complaint limited to The Monkey King, there has a been a lot of CGI in these kind of movies lately. This hasn't bothered me as much as it has others I think. I can appreciate the complaint, because it does make interactions between actors and the environment more ethereal. Sometimes it isn't well executed as well. But this is also firmly in the realm of myth, so I think it makes sense that they'd use a lot of CGI effects (particularly for the scenes occurring in Heaven and the domain of Dragon King of the East Sea). It is used abundantly throughout the movie to give it an almost cartoonish or dreamlike atmosphere. I think that works. I enjoyed feeling like I was in another place, not the real world. So this achieved it for me. Again though, if CGI isn't your thing, you might not enjoy it. The CGI wasn't always perfect because it was so ubiquitous, however I thought in comparison to many other movies in the genre, it did a good job (though again it was going for more of a family friendly approach). Generally what I'm finding is these movies are slowly getting better and better with CGI effects (or I am just getting more accustomed to them). I would cautiously recommend checking it out if you have an interest in Chinese mythology or any mythology for that matter. There are some places where the CGI could cause issues for some people. If you are familiar with Journey to the West and don't like too many alterations in your adaptations, that may also be a point of contention. I found the story engaging and the action dynamic and exciting. For gamers, I think there is a little less here than in some other adaptations. One area though where it can offer a lot is its depiction of The Heavenly Bureaucracy. If you are running any sort of high level campaign, it is definitely worth watching because there are aspects that could help a GM visualize those elements. 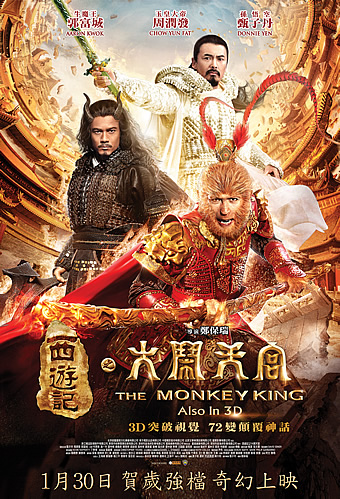 Interestingly the sequel (which is playing this week in the US) cast Aaron Kwok (who plays as Monkey King (he plays Bull Demon King in this version). Early reviews I've seen appear more positive and it looks to be a bit darker in tone and possibly better special effects judging from the previews. So it is probably also worth watching this version if only to catch up to watch the sequel. The Monkey Goes West is a 1966 Shaw Brothers release directed by Ho Meng Hua and starring Yueh Hua (Monkey King), Ho Fan (Tang Sanzang), Pang Pang (Pigsy), Kao Pao-Shu (Green Snake Demon), Tian Shun (Sandy Friar) and Lan Wei-Lieh (Black Wind King). It is the first in a series of four films that tell the story of Journey to the West. This adaptation of Journey to the West begins a little after Monkey King (2014) ends. It focuses on the Tang Monk's (Tang Sanzang) introduction to his major companions: Monkey King, Pigsy and Sandy Friar (Shu Wujing). It is reasonably faithful to the source material though it makes changes and mixes and matches some material to accommodate the medium. However, watching it, it is very easy to recognize where each change is derived from. So they will often combine chapters and blend elements. This was made in 1966 but it looks surprisingly good in terms of effects, sets, and costume design. The image quality has also held up (at least in the version I have). It does have a lot of musical numbers, which really isn't that uncommon with a film made in the mid-60s. If you watch a lot 60s and 70s martial arts films, many of the melodies will be familiar. 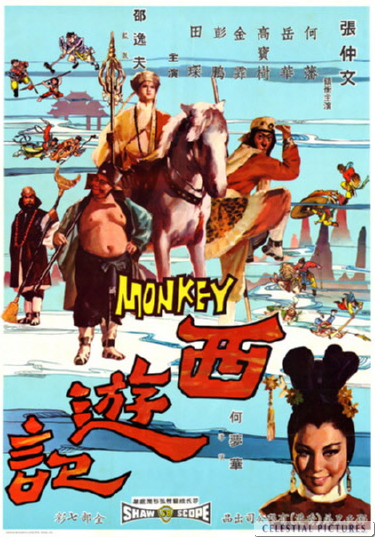 The early part of the film emphasizes Monkey King's difficulty adapting to life as a monk. He has just come out of his imprisonment in Wuxing Mountain and hasn't entirely given up all his evil ways (he is less bad than before but his temper gets the better of him on many occasions). It then follows Monkey King and Tang Sanzang as they set out and gain their companions. The story is entertaining though in places it is a bit on the slow side. It really starts to pick up about midway through. The fight choreography is pretty good, and being more in the style of the early 60s films (more swashbuckling than stylized). Yeah Hua is enjoyable as Monkey King but personally I felt that Pang Pang stole the show playing a lustful and gluttonous Pigsy. The set-pieces are wonderful (which is often the case with Shaw Brothers), complete with fuming mountains, caverns, villas and an undersea kingdom. I particularly liked the underwater sequence. The costumes are also very nice but some do require a little extra investment from the audience (again this was made in 1966). The monster effects vary considerably, but for the time they are not bad. Generally though monsters relying on make-up and costume are more convincing here than things like Sea Dragons. This is merely the first installment in a series of 4 movies, so I think it can be forgiven for taking a little time to set things up. Once it does get into the flow of things (roughly when Pigsy and Monkey King first meet) it is thoroughly enjoyable. I would recommend this film. I think particularly for gamers there is a lot to be gleaned. Watching it, I could easily see a GM spinning each of the major beats into a small adventure. Plenty of fodder for dungeons and the like. *There is debate over this.